Geothermal, or earth energy, is perhaps the most underutilized renewable source of energy. Whether using the earth’s naturally stable temperature to provide heating and cooling, or harnessing extreme heat from deep below the earth’s surface to generate electricity, the potential of geothermal energy has until now been largely untapped. But the geothermal marketplace is growing fast. Understanding the current technologies behind them can help building designers, business executives, and homeowners to take advantage of this renewable, clean and efficient energy source. There are two types of energy under the geothermal category, each markedly different from the other. A ground source heat pump, also known as a geo-exchange system, utilizes the near-constant temperature of soil just beneath the earth’s surface to heat or cool a building. Geo-exchange systems consist of an external loop of piping buried in the ground below the frost line, and an internal loop of piping within the building, filled with water or a mixture of water and chemicals. The fluid absorbs heat in the winter and transfers it to the house, while in summer heat from the house will be transferred outside. Geo-exchange is a proven technology now in use across North America. According to industry figures, geothermal heat pumps can reduce home heating and cooling costs by up to 70 percent annually. The other type of geothermal energy involves harnessing more extreme temperatures to create steam to drive a turbine and to produce electricity. In 2003, this type of geothermal power supplied just 0.416 percent of the world’s energy, reports the International Energy Agency (IEA), indicating tremendous potential for expansion. Generally, finding high enough temperatures requires drilling several kilometers deep. Geothermal reservoirs that are at least 240 degrees Celsius are required to generate high pressure hot water to create steam, although other methods can tap less extreme temperatures by using liquids with lower boiling points. This method is called Enhanced Geothermal Systems (EGS), and studies indicate it could play a significant role in our energy future, as an environmentally-friendly power generation method with potentially positive economics. Last year, an MIT study evaluated the potential for EGS in the United States, concluding it could supply a substantial portion of the country’s future electricity, probably at competitive prices and with minimal environmental impact. With an investment of $1 billion over the next fifteen years, geothermal could provide at least 10 percent of U.S. electricity by 2050, says the expert panel behind the report. Though it has received less publicity than hydrogen, solar or wind energy, geothermal possesses many of the positive characteristics of other renewable energies without some of the potential drawbacks. 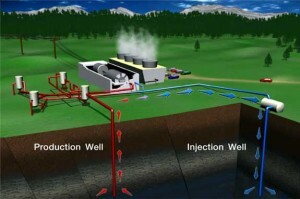 cost-effective, and commercial geothermal can also take advantage of low operating costs to produce competitive power. The other great advantage is that geo-exchange and hydrothermal technologies are well developed and proven in a variety of applications. As a proven technology with vast potential, geothermal energy is poised to take an increasing share of attention and investment dollars over the next several decades. For more information, visit GLOBE-Net. Why is it necessary to look for new sources of energy? Whar are the most used sources of energy in your country? Why are fossil fuels not sustainable? Which sustainable (renewable) sources of energy do you know? Using the heat inside the earth is sustainable, but not yetmuch done. Can you explain why? What makes the earth so hot inside? For the heat pump technology you do not need very hot water to heat the house. What is the technique behind this? People could wonder if taking heat from the ‘inner earth’ could cool the earth too much. Why is this not a risk? What is the real difference between both systems? How can ECS also be used for reducing the consumption of gasoline in cars? What could be drawbacks of geothermal energy?